Have you ever started a book, only to realize that you read it before and forgot about it? 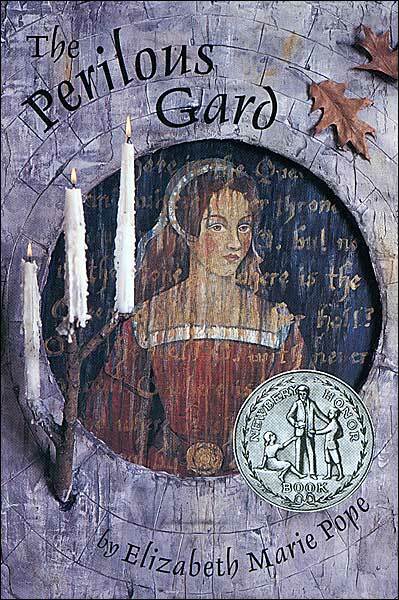 I hear people talk about that happening to them, but I can’t remember it every happening to me until today, when I was about a third of the way into Elizabeth Marie Pope’s 1974 children’s book, The Perilous Gard. It was just too familiar to be a first-time read. I have no recollection of when I read this book before or what I thought of it then, but I enjoyed it this time very much. The novel is set in 1558 England, and Kate Sutton has recently come to serve as a maid of honor to the Lady Elizabeth, but a rash complaint from her sister, Alicia, leads Kate to be banished by Queen Mary to an out-of-the-way castle in Derbyshire called the Perilous Gard. The castle is filled with mysteries. There’s an enchanted well, a missing child, and a strange woman who appears and reappears at the strangest moments, noticed only by Kate. As Kate remains at the castle, she starts to untangle the long-standing pain that exists between Sir Geoffrey, the owner of the castle, and his brother Christopher. But resolving the conflict and ending the pain will require her and Christopher to delve into the world of the fairy folk. These are the fairies of such stories as “Tam Lin,” and All Hallow’s Eve is approaching. Their tradition requires them to give a teind—a sacrifice—to the devil on that night. Kate is determined that there will be no sacrifice, but the fairies have ways to turn others to their will. It takes a strong mind to resist, and that resistance only causes the fairies to offer different, more pleasing temptations. Kate must be clever and strong-willed if she is to keep herself and Christopher safe from the fairies on All Hallow’s Eve. Kate is a resourceful and appealing heroine in the manner of so many heroines of children’s literature. She’s awkward and unsure of herself and feels loathed and second-rate. Yet her best qualities, her resolve and curiosity and observational skills, are exactly what is needed to navigate the fairy world. And in a strange way, the fairy world works a sort of magic on her. It gets her out of the shadow of her sister, but it also puts her among those who recognize her strong character for what it is, and while they may not value her strength, they appreciate its power. The plot is a variation on “Tam Lin,” so the climax is predictable to those who know they story. The really great stuff is in all the time Kate spends in the fairy world before the fateful night. The creepiness factor is high, largely because it relies so much on mind control rather than brute force. And then there’s the romance, which is also predictable, but I was still thrilled to see it unfold. I read the book over the course of a single day, when I was getting over a nasty bug, and it was the perfect diversion. I read this a few years ago (on Jenny’s recommendation, I believe) and also enjoyed it a lot. Great atmosphere and great characters. You can easily guess where the story’s going, but in a comforting rather than a dull way. I agree that the predictability is more comforting than dull. It’s funny how that works sometimes. Another good book I missed! 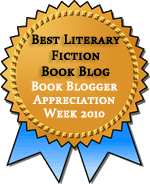 Does the author handle the historical setting well? Lisa, I think she does — the court politics are backgrounded but plausible, and the history seems right. In particular the handling of Christianity versus the pagan fairies is well done, something you don’t see in every book. And you’ll see Lymond-like tendencies in the hero! Yes, what Jenny said. This isn’t really the kind of book you learn history from, but you can get a sense of the time. Sounds like a great book! Can you sort of zero in on what exact (or closely approximate) age group it’s for? Thanks. I would guess maybe 9 to 13. It seems like the kind of book I would have read in late elementary and middle school, although the story is enjoyable enough for older readers too. I have done that a few times. However, I usually re-read books on purpose :-). What is embarrassing is coming home from a book sale to find out that the cool book you found is already on your shelf. This may be the first time I’ve reread by accident, but it was a good story to revisit. And I’ve made the same book sale mistake. Just once, though! Neither vanbraman nor Teresa should feel embarrassed by the “I-just-bought-a-repeat-purchase” mistake: whether I buy books at a sale or pick them up for free from a giveaway, I’ve repeatedly done the same thing. When the editors or commentators of the books are different, the forewords or prefaces are different, I’ve excused myself and kept the two copies; otherwise, I give the less appetizing copy away to another free sale. So don’t feel foolish (by comparison with me, you’re regular wizards!). I made you read this! The hero is so Lymond-like, I loved it. Completely enjoyable. And the ending is so well done. That’s right! I remember now–you lent me your copy when we lived in Sterling. I hadn’t thought of Christopher as Lymond-like, but now that you mention it, I can see what you mean.